President Bush named John Negroponte, the U.S. ambassador to Iraq, as the government's first national intelligence director Thursday, turning to a veteran diplomat to revive a spy community besieged by criticism after the Sept. 11 attacks. Ending a nine-week search, Mr. Bush chose Negroponte, who has been in Iraq for less than a year, for the difficult job of implementing the most sweeping intelligence overhaul in 50 years. Negroponte, 65, is tasked with bringing together 15 highly competitive spy agencies and learning to work with the combative Defense Secretary Donald H. Rumsfeld, the brand new CIA Director Porter Goss and other intelligence leaders. He'll oversee a covert intelligence budget estimated at $40 billion. CBS News White House Correspondent Mark Knoller reports it's an open secret that President Bush first approached former CIA Director Robert Gates about the intelligence job, but he took a pass. Sources say others were approached as well before Mr. Bush settled on Negroponte. Negroponte, a former ambassador to the United Nations and to a number of countries, called the job his "most challenging assignment" in more than 40 years of government work. His U.N. nomination was held up for half a year in 2001 over criticism regarding his record as ambassador in Honduras from 1981 to 1985, the time of the Iran-Contra scandal. If confirmed by the Senate, as expected, Negroponte said he planned "reform of the intelligence community in ways designed to best meet the intelligence needs of the 21st century." : he knows very little about the government's Byzantine budget process. Yet he will now be responsible for a multi-billion dollar budget stretching across 15 different intelligence agencies. But, notes Martin, as a five-time ambassador, he has a world of experience in the nitty-gritty of foreign relations. 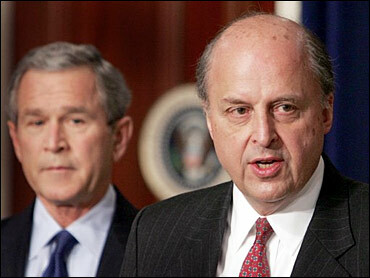 President Bush signaled that he sees Negroponte as the man to steer his intelligence clearinghouse. "If we're going to stop the terrorists before they strike, we must ensure that our intelligence agencies work as a single, unified enterprise," Bush said. Negroponte will have meet with the president in daily intelligence briefings and will have authority over the spy community's intelligence collection priorities. Perhaps most importantly, President Bush made it clear that Negroponte will set budgets for the national intelligence agencies. "People who control the money, people who have access to the president generally have a lot of influence," said Mr. Bush. "And that's why John Negroponte is going to have a lot of influence." The president also announced his choice of an intelligence insider to serve as Negroponte's deputy: Lt. Gen. Michael Hayden, the National Security Agency's director since 1999. As the longest-serving head of the secretive codebreaking and eavesdropping agency, Hayden pushed for change by asking some longtime personnel to retire and increasing reliance on technology contractors. For years, blue-ribbon commissions have proposed creating a single, powerful director to oversee the entire intelligence community, but the concept didn't gain momentum until recommended by the independent Sept. 11 Commission. President Bush and other senior administration officials initially resisted, but reversed course after an exceptional lobbying effort by the families of 9/11 attack victims. Congress approved the new post in December as part of the most significant intelligence overhaul since 1947. Yet intelligence veterans remain concerned about whether the job will wield enough power to lead government elements that handle everything from recruiting spies to eavesdropping to steering satellites. Some say the authorities of the intelligence chief are too ambiguous as established in the legislation. The position was also excluded from the Cabinet to shield it from politics, requiring Negroponte to work directly with more senior personalities such as Rumsfeld. According to one informed administration official who spoke on the condition of anonymity, former CIA Director Robert Gates was the White House's first choice, but he and other candidates declined the post over concerns about the job's authority. White House Chief of Staff Andrew Card rejected reports that Bush had a difficult time filling the job. "It's just not true," he said. Bush has trusted Negroponte with trying assignments. He was ambassador to the U.N. when U.S. relations with the world organization were declining over the approaching Iraq invasion. Last year, Bush sent him to Iraq as ambassador during the middle of a bloody insurgency. Negroponte has held official posts in eight countries, including ambassadorships in Honduras, Mexico and the Philippines. He also understands the intelligence demands of policy-makers, serving in President Reagan's National Security Council from 1987 to 1989. Some Democrats on Capitol Hill expressed concern that Negroponte's departure from Iraq would create a crucial vacancy less than a month after the country's first democratic elections. During consideration of his U.N. nomination, critics suggested he had played a key role in carrying out the Reagan administration's covert strategy to crush the left-wing Sandinista government in Nicaragua — an element of the Iran-Contra scandal. Human rights groups also alleged that Negroponte acquiesced in rights abuses by Honduran death squads funded and partly trained by the CIA. Negroponte said during his U.N. confirmation hearings that he did not believe death squads were operating there. In a statement Thursday, Senate Intelligence Committee Chairman Pat Roberts, R-Kan., praised Negroponte's selection and said the panel would hold a confirmation hearing as soon as his duties in Iraq are complete. A Roberts aide said that could still be weeks away. The committee's top Democrat, Jay Rockefeller of West Virginia, called Negroponte "a sound choice." Others reacted more coolly. Said House Democratic leader Nancy Pelosi of California: "As one who has disagreed with Ambassador Negroponte for over 20 years ... I am pleased that he is now in a position that doesn't have anything to do with policy."